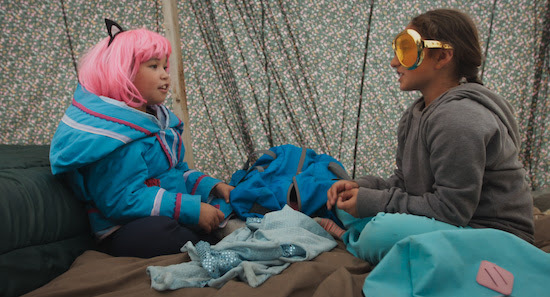 The Art Gallery of York University’s (AGYU) spring 2019 exhibition includes film, objects, and photography made over three decades by internationally celebrated Arnait Video Productions, the dynamic collective of Inuit and non-Inuit women artists from the North who put Inuit innovation and tradition first. Arnait Video Productions (Igloolik, NU/Montreal, PQ) gives voice to several generations of Inuit who articulate the challenges and opportunities that arise when living and working between Inuit and non-Inuit world views. Arnait Video Productions was founded in 1991 by Atuat Akkitirq, Susan Avingaq, Marie-Hélène Cousineau, Madeline Ivalu, and Carol Kunnuk. Uyarak (Lucy Tulugarjuk) is the newest member of the team. Arnait Ikajurtigiit is curated by AGYU’s Interim Assistant Director/Curator Alissa Firth-Eagland and is a Primary Exhibition of Toronto’s Scotiabank CONTACT Photography Festival, presented in conjunction with the 2019 Images Festival Off-Screen program. Arnait Video Productions is distributed in Canada and internationally by Vtape.